Yanko Tihov is a painter and printmaker who trained in Sofia and works in London. His work is broadly autobiographical, characterized by his willingness to explore human nature through different series of figurative and surreal urban work as well his newer series of works inspired by history, immigration and changes to the world map. 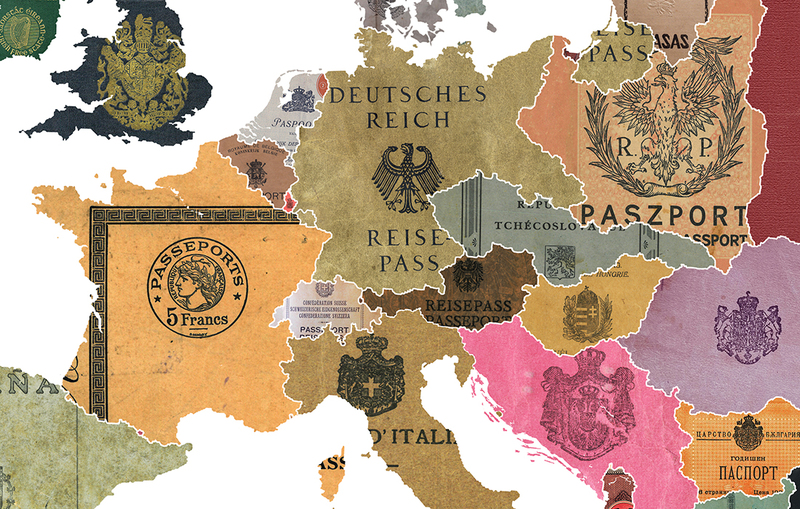 In his passport series the design is determined by the colours and motifs of each country’s passport, which the artist carefully matches and re-creates within the correct national borders. Tihov has hand-painted the texts, seals and coats of arms which adorn the covers with real 24 carat gold, successfully capturing their individual details. The paint adds a unique layer to each work which beautifully reflects the light and enlivens the surface. Overall his passport series serves as both a reminder of the laws and jurisdictions which bind individuals, and offers unique examples of contemporary cartography which beautifully captures the borders of today’s world. 1998 - Department of Printmaking at the National Academy of Art. 2000 –National Academy of Art - “Drawing 2000 competition”. 2009 – ING Discerning Eye Exhibition, Drawing Bursary, Runner up prize.